Verifying the quality of measurements is essential for every analyzer. We offer Convergys BG ISE Metabolite Control as a 3-level control kit for blood gas, electrolyte and metabolite parameters. 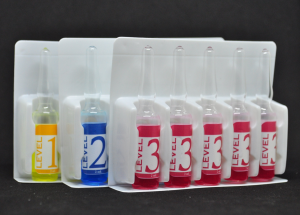 Each kit contains 10 vials of each level (low, normal, high), and 30 vials in total. One vial contains 2 ml of control reagent. The following parameters are covered: pCO2, pO2, pH, Na+, K+, Cl–, Ca++, Glucose and Lactate. The controls are meant to be equilibrated at 25°C and measured at 37°C. Stored at 2°C to 8°C the product is stable for thirty-six months from the date of manufacture. At room temperature (20°C to 25°C) the controls may be stored (unopened) for up to 12 months.